This month I had the pleasure to interview the Don, from the Jones Brothers. They are nice guys, working constantly with Kwik (they have created already six apps, with more coming this year) and willing to share their knowledge with others. Check for their apps in our Showcase. I am looking forward to check their new adventures, as I am a big fan of their design style. Kwiksher’s questions are in bold, to facilitate the reading. Feel free to send more questions to them, via comments below. I am sure they will appreciate. Enjoy! Tell us a little bit about you. Where are you based, for how long are you writing and illustrating – in sum, what is your “story”? A self-described “artistic fraternal force,” Brother Jones is comprised of three brothers Doug, Dennis and Don. Doug resides in the outskirts of Music City in Brentwood, Tennessee; Dennis works from a cornfield in Huntington, Indiana; and I live in the center of the USA — Nixa, Missouri. Doug and Dennis are successful freelance illustrators and I’m locked on a designer/art director career path. 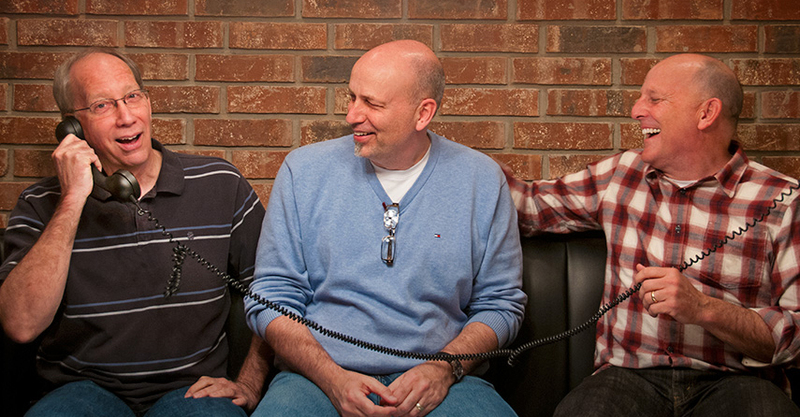 Between the three of us, we’ve logged well over 100 years in the commercial art world. Gosh! We are old! Can you give us a little more insight on the Jones brothers? We grew up in Mountain Grove, a small town in southern Missouri. Our time was spent reading comics, putting models together, playing music and drawing… lots of drawing on the back of church bulletins during Sunday morning sermons. Over the years, we’ve worked on hundreds of books, storybooks, school curriculum, magazines, etc., for many different clients and publishers. Dennis has done quite alot of work with Zondervan Publishing. His “Read with Me Bible” is one of their best selling children’s books. In 2002, we worked together on another Bible titled “The Super Heroes Bible.” Working on projects together has always been fun for us. Plus, all that combined, brother brain-power usually results in a much better end product. How did Brother Jones come about? Back in the early 1990s, Dennis and I were discussing the latest “big thing” on the horizon — the World Wide Web. We talked about creating an online presence and even the possibility of selling artwork and other things. A decade later, with the help of my son, Keegan, brotherjones.com was built and launched. Within a week of its debut, the website was chosen as “Site of the Day” by Favorite Website Awards (FWA), which hailed the site as “beautifully elegant, stylish and innovative,” and labeled the brothers as “talented and awe-inspiring.” In hindsite, our website was pretty much a forerunner to Facebook. We could post pictures, and we had a comment section where we would converse with each other and crack jokes. We had tons of fun and apparently thousands of others enjoyed hanging out there as well. How did you arrive in the storybook app market? 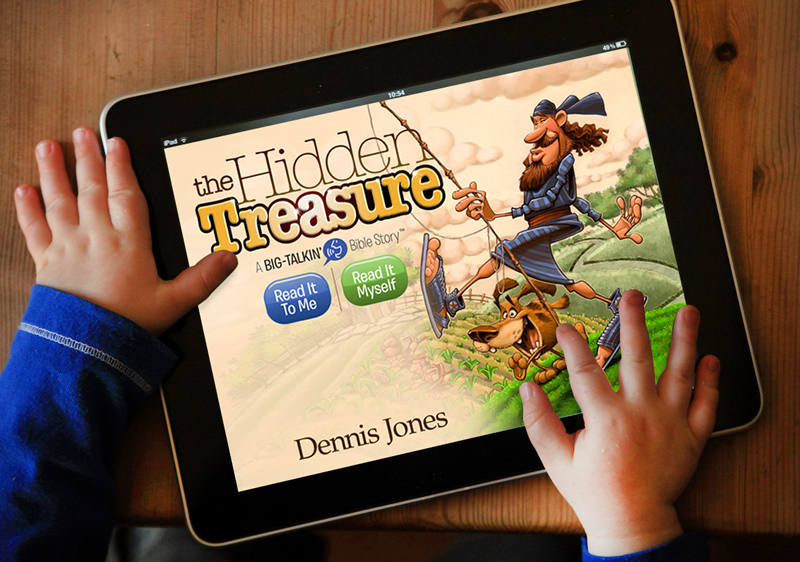 Over the years, Dennis and I have continually talked about creating some sort of ebook or downloadable digital book. Dennis had already written and illustrated a few books for promotional purposes. He began working up iBook versions of his stories while I began working up a solution with Adobe software. The challenge of creating a digital book/app conjured up so many questions: How and who do we get to build the app? What’s the best size and dimensions for an interactive book? What is the process for getting an app in the App Store without spending a bunch of money? The entire process appeared very complicated and proved to be quite frustrating to say the least. As soon as Kwik was loaded up, I began watching tutorials, reading the support User Guide materials. I also received some really helpful insights from Diane Cipollo’s tutorials. I’d try new things, different versions of pages. If I came across a problem or question, I’d post in the forum and the Kwik community was very helpful. And it goes without saying, Alex is the best in responding to problems and answering questions. After a few initial Kwik trial runs, I just jumped in and got to work on our first app — “Trouble On the Road.” At the same time I signed up for the SVS Training (now Kwiksher’s Official Training). Each week, I would get some online training and hang with Alex and Will Terry. I really enjoyed this weekly class. I lived and breathed Kwik and the whole app building process for about 6 months. At the end of that time, we had our first complete, interactive storybook, approved and available for sale in the Apple App Store… without writing one piece of code! Unbelievable. Any tips and tricks to someone willing to follow your steps? What you would do or do not again? It’s been exactly one year since I picked up Kwik. Today we have 6 apps approved and for sale in the Apple App Store. I never imagined creating that many apps within the course of one year! Fortunately, we had a jump start with existing stories and illustrations already in place for the storybooks. But, we did create an all new puzzle app title Bible Jigz as well as another magazine style app. Doug and I worked up a fun little mobile app titled “Flippy Face” based on a game we had growing up. All that to say, once you get the hang of Kwik you can really start producing some serious work. Staying organized with files, and focusing on the goal is really important. Don’t give up and enjoy the process. Are you doing or planning to do any marketing initiatives to promote your apps? I recall in the last SVS Training session, Alex talked about marketing as another big challenge in and to itself. We have done the obvious marketing strategies: website, social media, blogs. Our results have confirmed that if you talk about your apps, get them out there in every conceivable way possible… the effort results in more sales. In the next couple of months, we will be doing a direct mail piece and then try to have some sort of marketing “push” for Christmas as well. What is coming in a near future? Anything you can share at this point? We’ve started to work on the third selection in the “Big-Talkin’ Bible Story” series titled “The Cheatin’ Little Cheater.” This story is about a little man named Zac who has some really big problems. This app will have more of a comic book feel and will have a vertical orientation. Should be fun. I think anyone who has some Photoshop experience and a desire to create an interactive storybook app can achieve success with Kwik. It’s a great product, and we’re really happy with all it can do.